Feta is the most famous traditional Greek cheese, dating back to Homeric ages (wwwGreece). It was granted protection under the European Union (EU), PDO, in 2002 and only cheeses made in the mountainous regions of Macedonia, Thrace, Epirus, Thessaly, Sterea Ellada (Central Greece), Peloponnesus, and Mytilini (Lesvos), from ewe’s or goat’s milk can bear the name ‘Feta’ (within the EU). Feta is classified as soft brined cheese. It is usually cut into small blocks and vacuum packed along with a little brine. The firmness, texture and flavour varies from region to region. 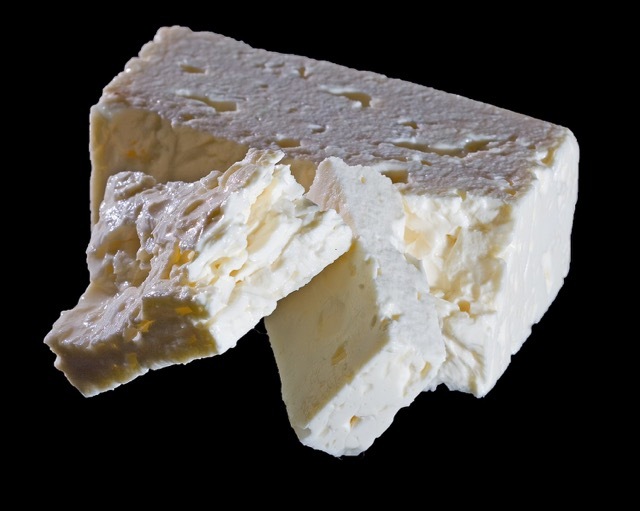 For example, Feta from the Peloponnese (Peloponnesus) tends to be harder, drier and saltier than Feta made in Thessaly, and Feta from Macedonia tends to be creamy and mild. The flavour is salty and slightly acidic, and can be mild, or sharp and peppery or with a more pronounced sourness. Feta made from Goat’s milk has a very fresh taste that hints of wild herbs, white wine and slightly goaty tang. Ewe’s milk Feta feels a bit richer and creamier and is more ivory white. The taste is reminiscent of roast lamb, lamb fat and lanolin. Both have a salt tang on the finish and a depth of flavour from grazing in the wild (World Cheese Book). Feta forms a significant part of the Greek diet. It’s so popular in Greece, that very little gets exported. It becomes delicate and complex in its flavour when cooked, and when baked, its sharp flavours mellow, and its richness and complexity come out. It’s is used as a table cheese, and in salads, usually with olives, tomatoes, raw onion, and olive oil (e.g. the Greek salad); or mixed with any combination of cooked or raw vegetables; or served with some olive oil or olives and sprinkled with aromatic herbs such as oregano. It’s used to make Spanokopita, the delicious cheese and spinach pies found all over Greece and tyropita (cheese pies). It can also be served cooked or grilled, as part of a sandwich, in omelettes, or as a salty alternative to other cheeses in a variety of dishes. It’s crumbled into salads, stuffings, gratins and savoury pies, melted into sauces, especially with seafood, whipped into dips with herbs and olive oil, pan-fried with crunchy crusts, and savoured on its own. Quite often served as saganaki (shallow-fried cheese) see Flaming Cheese Saganki. If you find Feta to be too salty, simply soak a chunk in cold water or milk for 10-15 minutes. This removes excess salt but does not mask the flavour. Feta-like cheeses are commonly made outside the European Union from full cream or partially skimmed Cow’s milk. They are often called white cheese, Greek Style Cheese, Salad Cheese, Balkan Cheese, Feta Style Cheese, Greek Cheese, White Brined Cheese, Sheep Cheese, Sardinia. The salty flavour of Feta pairs well with beer, Pinot Noir, Sauvignon Blanc and Zinfandel. Prev What is Pink Peppercorn?